OK now, before we get started here I want you all to gather around there behind the bench. Like a family photo. We are going to gang-cut all the dovetails on all your tail boards with this one saw from Lie-Nielsen. Yup. One cut. One and done. And you are going to be amazed. Yup. Look amazed. 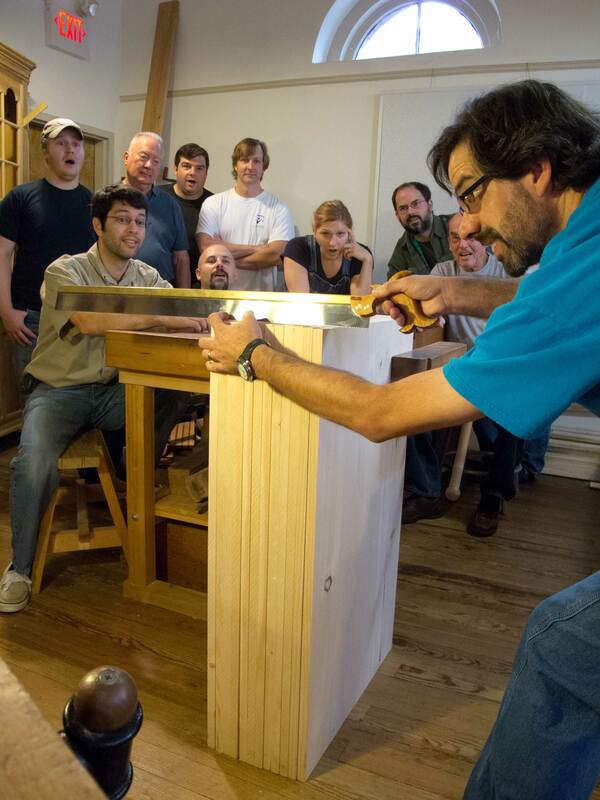 Chris, drop your left hand there so we can see the saw in all its awesomeness. Now remember folks this is amazing. Look amazed. Ready? This entry was posted in Saws. Bookmark the permalink. Man, you’re my kinda goofball! How long is that saw? Now I suppose that you expect me to make a fretsaw that will cut all of those at e the same time? Charlie Chaplin prop or Pinocchio’s saw? Is that going to be a # 1 or # 2 cut? I am totally amazed. Was class running a wee bit behind schedule? You’re such a dag, Chris! …Nice one!! It’s true what they say: It’s not the size that counts, it’s how you use it! Very apt when applied to “bulk dovetailing”. Say something intelligent . . . that’s a little challenging at the moment. The man in the white shirt is probably the justifiably proud Lie-Nielsen representative? Great photo nonetheless. 1. To Lie Neilsen for making the saw. 3. To you and your class for remembering to have fun in the workshop. I have nothing intelligent to say, so . . .
Yours may be longer, but mine’s thicker. If at first you don’t succeed, . . ., bomb disposal is not for you. Pulling a long saw from inside your waistband seems fraught with danger. Ha! I thought it was photoshopped at first. Thanks to joecrafted for the earlier video. That’s even funnier than the Veritas dodeca-gauge. Just noticed that the guy with the shaved hair and goatee looks like a disembodied head.